It’s remarkable how the smallest details can end up changing your life. 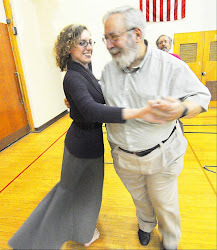 I first started contra dancing on a whim, almost by accident, when a friend requested I go along with her to a dance so that she’d have “someone to hang out with.” Little did I know then what an impact the contra community would have on me. A lifelong lover of music and dance, I have been training for the past decade or so as a classical musician, both a pianist and a singer. By the end of this past May, I had just completed my masters degree in voice, and after six years of higher education in music, felt burned out, unmotivated, and discouraged, wondering what on earth I could do with the skills that I had slaved over for years but wasn’t yet even close to mastering. I’m very lucky that contra dancing found me when it did; otherwise, I may have simply drifted into musical obscurity, not really caring what became of my future as a musician. In the contra community, I found a group of people and ideas that provided me with the “missing ingredient” I had been searching for in the world of classical music: joy. If nothing else, the contra dance community has gotten one thing right that so many other more formal artistic communities have missed: that dance, music, or really any art form, should originate from a deep sense of inner joy. In the classical music realm, I often struggled with my true reason for making music: was it for self-expression? To please my teachers? To gain the acceptance or admiration of my peers? In the contra world, this anxiety over the relationship of self and others (peers, teachers, critics, etc) is eliminated through its emphasis on the deeply meaningful expression that comes when an entire community takes part in an art form, allowing for both individual and corporate expression, all of which is driven by an infectious sense of joy. By “joy,” I don’t necessarily mean happiness - clearly, not all art is motivated by happiness; indeed, some of the greatest examples of artistic achievement have come from intense expressions of grief or sadness. Instead, I mean a deep sense of well-being and belonging, which often, but not always, leads to an outward expression of “happiness.” It is this joy that leads to the most effective music-making. The classical music world, sadly, focuses so much on criticism that it often creates a profound feeling of inferiority and alienation. I would like to suggest that the contra community is the perfect anti-dote to this effect. By the time I finished graduate school, I struggled with severe tension issues and a crippling lack of confidence in my abilities as a musician. I sensed that there was a truly talented artist somewhere inside of me, but that it was buried under so many layers of anxiety and fear that I might never find it. When I began dancing at contra events, however, I felt an immediate sense of freedom that I hadn’t ever experienced in other musical settings. I was allowed to simply take part. Instead of being criticized for “doing it wrong,” I was strongly encouraged to keep trying. Through dancing, my relationship with music changed from one of debilitating fear over being wrong to one of unencumbered self-expression. I was finally being freed from the prison of my musical anxieties. The real break-through came for me when I began playing piano for contra dances. Of course, I am even newer at that than I am at dancing, but it has already transformed my life as a pianist. For the first time, I feel a real connection between my musical ideas and the keyboard. In classical music, there is a profound barrier between the musician and the music: the fact that someone, the “composer,” has already dictated every note the performer is supposed to play. This makes self-expression extremely difficult, since the performer is essentially following a meticulous set of directions; the music begins as a foreign, “outside” entity, which must be ingrained into the performer. In the folk music tradition, however, one makes music from the inside out - the (relatively) simple tunes quickly become a part of the musician’s “musical DNA,” and the resulting music is a pure expression of the musician’s own ideas and creativity. When I began making music this way, I discovered that I could directly translate my own musical ideas to the keyboard. It was a profound experience that has substantially changed my approach to classical music. I should note here, of course, that I don’t mean to lessen the importance or brilliance of classical music in any way. The classical tradition has provided Western culture with some of the most beautiful, sophisticated, and poignant artistic gems the world has ever known. Rather, my intent is to point out the flaws that have become inherent in the pedagogy of classical music, and that contra provides an almost miraculous cure. As I began applying the feeling of spontaneity and freedom that I gained from contra in my classical playing, I was transformed from a meek, apologetic pianist to a competent, confident one. That talented musician that I knew must be hidden somewhere has finally started to come out. The reason I’ve gone to such great lengths to describe my own experience as a classical musician encountering contra dance is that I believe that this tradition could have a huge impact on the pedagogy of classical musicians. I know I’m not the only classical musicians who’s felt discouraged or beaten down by my training. Just think - if the infectious joy of contra were to take hold in classical music, we would have a generation of classical musicians who play with vitality, spontaneity, and self-acceptance. I want to set out on a journey to explore what contra could give to the classical music world - what would this look like? How might it be practically implemented? What problems or difficulties might such an endeavor face? Contra literally gave music back to me - and I would love to see it do the same for others! As professional pianist and singer, it's literally my business to take an active role in shaping the way the world today thinks about music. When I first began taking part in the folk community through contra dance in the summer of 2010, I sensed something very special about it, and immediately recognized that this tradition has something very important to offer the world of classical music and art - and the world in general! This blog is intended to explore how folk traditions can rejuvenate classical music, art, and living.